It allows for better inventory of systems running Windows compared to WMI and is relatively easy to setup. It can be done through a GPO in your Active Directory. WinRM is enabled by default on Windows Server 2012 R2 but disabled on all client operating systems earlier than Windows Server 2012. For Windows XP and Windows Server 2003 (both are EOL) you must install “Windows Management Framework Core package (Windows PowerShell 2.0 and WinRM 2.0)” to enable WinRM support. WinRM can use both HTTP (port 5985) and HTTPS (port 5986). This guide will focus on HTTP since it does not require installation of certificates on the target machines. On your AD server, create and link a new GPO to your domain. After the GPO has been created, right click it and choose “Edit…”. 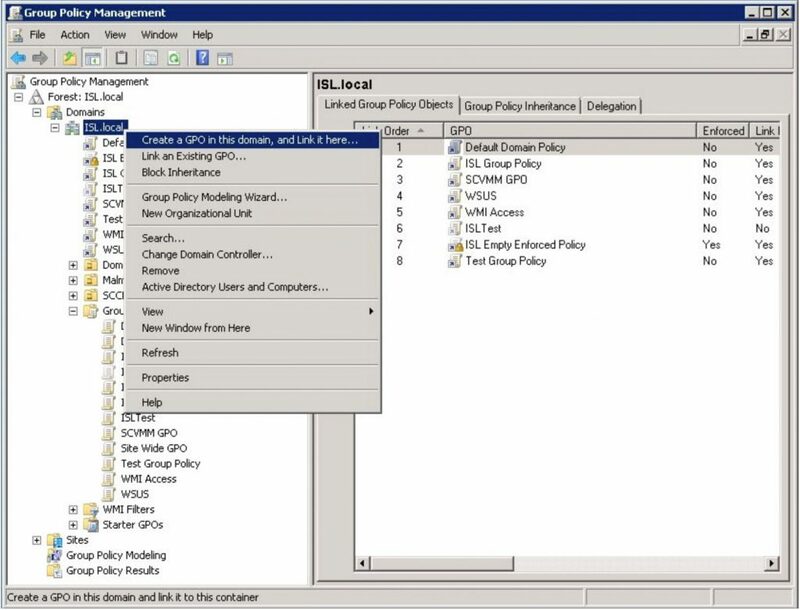 In the Group Policy Management Editor: expand Computer Configuration > Policies > Administrative Templates > Windows Components > Windows Remote Management (WinRM) > WinRM Service. On the right hand side edit the “Allow automatic configuration of listeners” policy setting. 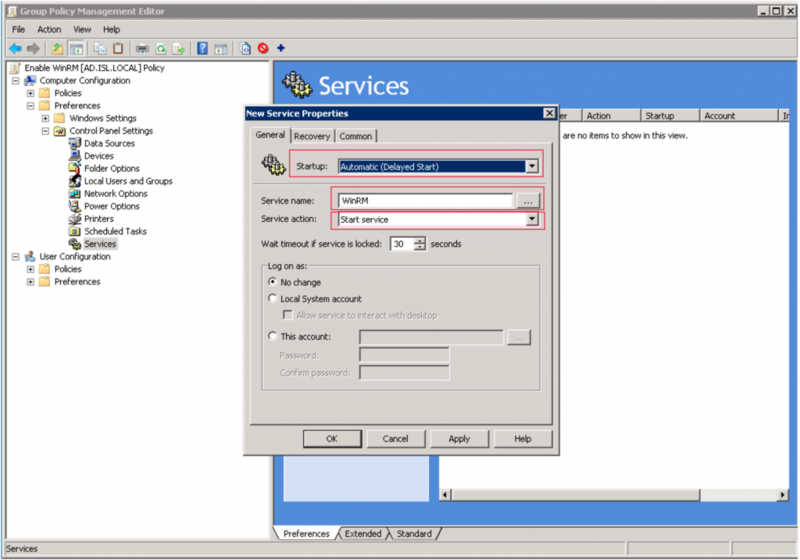 The same setting can be named “Allow remote server management trough WinRM” in some configurations. Here you specify which IP-addresses the WinRM service will listen on. Specifying “*” here means that the service will listen on all interfaces which should be fine. Next we need to make sure the WinRM service automatically starts on all machines. 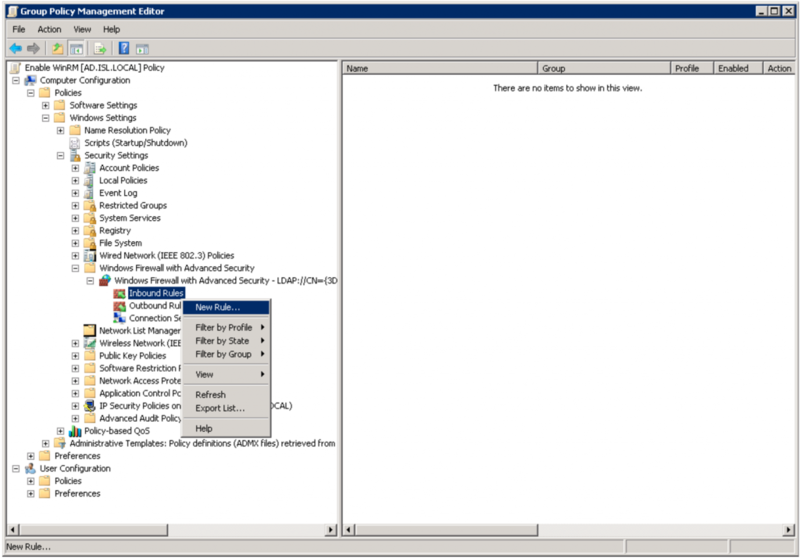 In the Group Policy Management Editor: Expand Computer Configuration > Preferences > Control Panel Settings > Services. 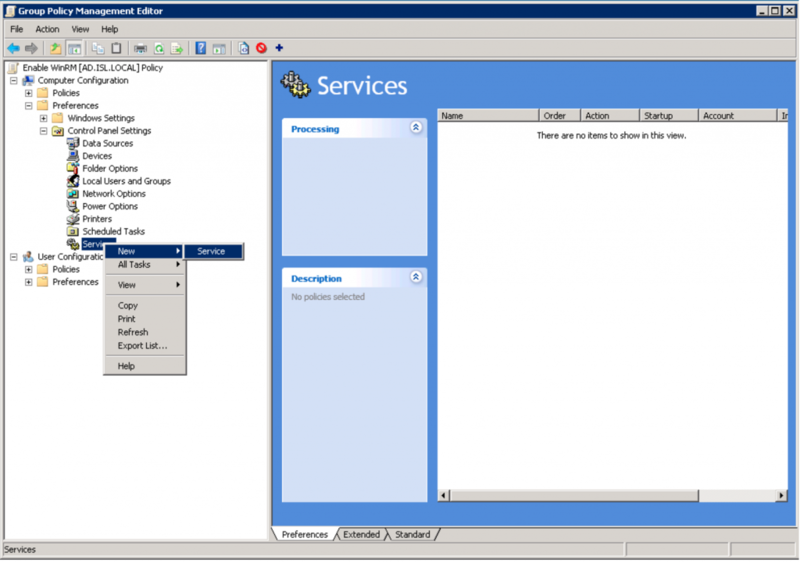 Right-click the Services and choose New > Service. Set Startup to “Automatic (Delayed Start)” and click the “…” next to Service name and search for Windows Remote Management (WS-Management) and select it. Finally, set Service action to “Start service”. Click OK to save the settings. WinRM uses ports 5985 (HTTP) and 5986 (HTTPS). To open the firewall for port 5985, expand Computer Configuration > Policies > Windows Settings > Security Settings > Windows Firewall with Advanced Security > Windows Firewall with Advanced Security > Inbound Rules. Right-click the Inbound Rules node and choose New Rule. 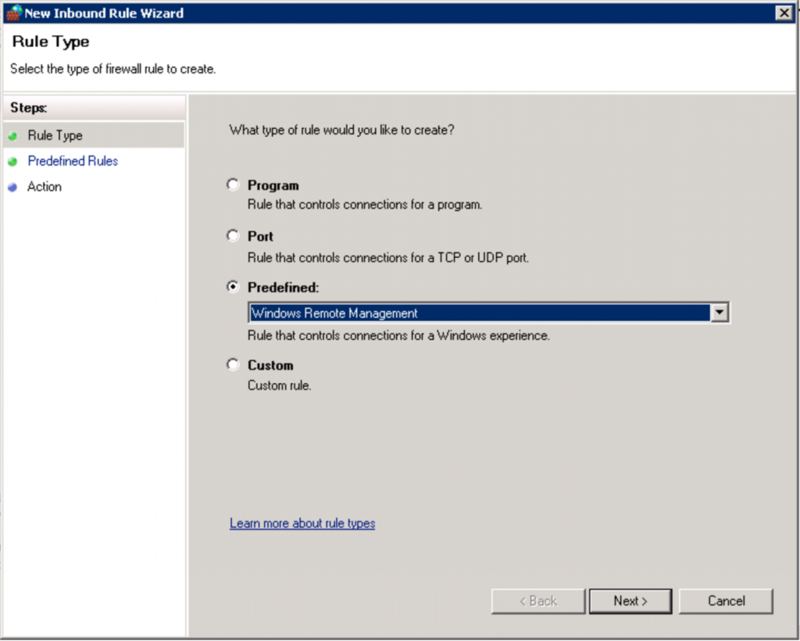 We’ll use a predefined rule so select “Windows Remote Management” from the dropdown and click Next. 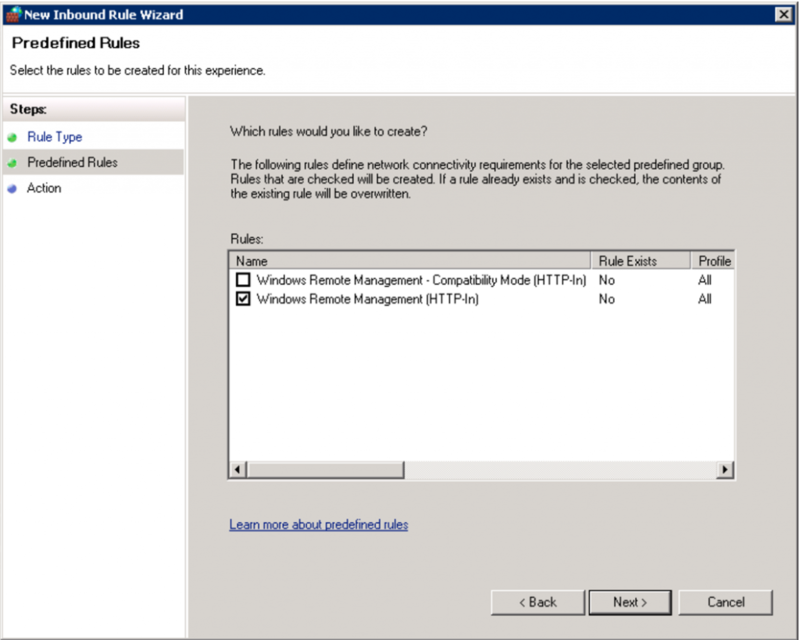 Make sure “Windows Remote Management (HTTP-In)” is selected. We don’t need the compatibility mode. Click Next. Choose “Allow the connection” as Action. Click Finish. Now the GPO is configured and linked to your domain. Either wait for the GPO to propagate to your machines or force an update. To test the configuration on a specific machine, log on to it and run “gpupdate /force” in a command prompt to force update of GPO settings. Replace ‘USERNAME’ and ‘PASSWORD’ with your login information. Next, let’s invoke a remote command on a remote machine. In this example we run “ipconfig /all” on “vscope-demo2”. You should see output from ipconfig if all is well. To enable WinRM in vScope, add a WMI-credential through Discovery Manager and under the “Advanced” section, make sure “Enable WinRM” is selected. This will enable WinRM through HTTP. 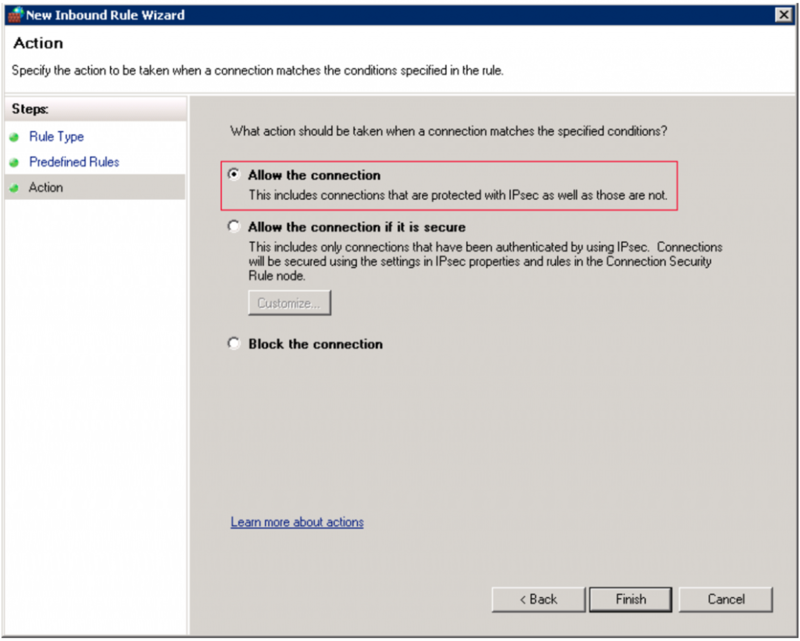 To use HTTPS (make sure you have configured your machines for this) select “WinRM Use HTTPS”. This command will open up a prompt where you enter the password for the credential. If everything works you should see information about the target machine otherwise an error message will be shown.